This right here is my sanctuary. My safe haven, if you will. I usually lay here and think about the week I've had and make decisions for the next. But for once in my life, I found myself staring ahead at the wall, feeling nothing. Empty. Almost numb. There was nothing to think about - to plan. 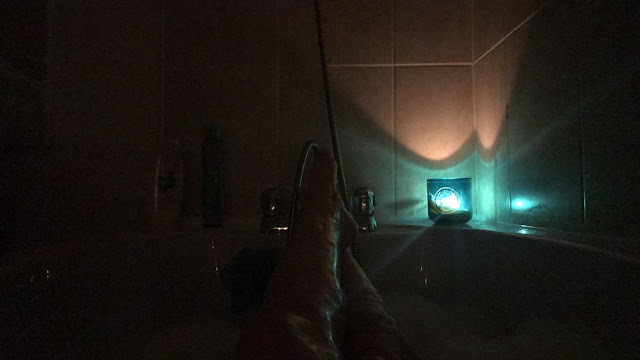 I was just in the moment, music on and candles lit. And I felt alive. Content. It almost felt wrong. Being lost in a moment and feeling nothing but contentment. When you think about the world at the moment and everything that's happening. But it was nice. No heaviness, no worries - just the moment. And I wondered if it was because I was finally, truly happy. That I've let all the things that brought me down go, and I'm finally accepting this life, being who I want to be; with nothing holding me back. And it's a nice feeling, and I hope it lasts forever.